This Lentil Soup is perfect for a cold winter day. Rinse lentils and cook until tender in 3 quarts of water. Peel, wash, and chop potatoes. Add to the pot of lentils and cook for 15 minutes. Peel and wash the carrots and onions. Cut the onion into cubes. Grate the carrots. Heat the pan, pour in the oil. Fry, stirring, onions and carrots for 3-4 minutes over medium heat. Then add the flour. Stir. Then add the tomato paste. Continue cooking, stirring for about a 1 minute. Add the onion and carrot mixture to the pot with lentil. Slice bell peppers into strips. Chop green onions, and grate the garlic. 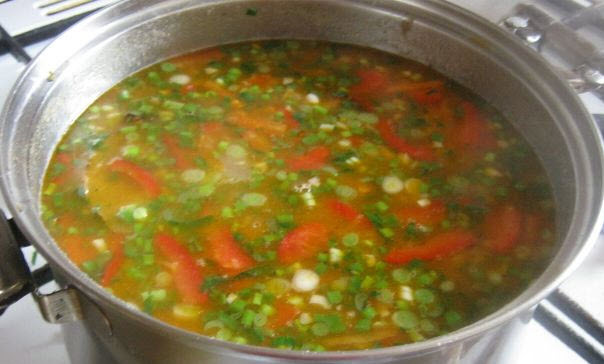 Put the vegetables in the soup, add salt and pepper to taste. Add the bay leaf. Cook over very low heat, covered, for 5 minutes.